In December 2017, DOOGEE presented its new Android smartphone with the largest battery the world has yet to see. Stocked with a 12,000 mAh battery, the phone also features a 130 degree wide angle front camera and an 18:9 6-inch Full HD+ display. We were able to get our hands on of the DOOGEE BL12000 and have prepared an unboxing video for you, as well as our first impressions and phone setup information. Who needs a phone with a 12,000mAh battery? The DOOGEE BL12000 is really a unique smartphone with an almost bezel-less display and a battery that is sure to please many: from travelers or outdoor adventurers who don't often encounter a power socket, to long-shift workers, or for those who always complain of dying phones due to small battery capacity, this phone will allow you to keep going with worry that the phone will let you down along the way. The first time you hold the box in your hand prior to opening it, you can definitely feel that this is heavier than the average smartphone. However, with great power comes obviously a greater weight and that is a trade-off many users might be willing to accept. To get to the phone, you need to remove the BL12000 from the protective bag, an enclosed plastic case, which is included in the price of the phone (nice extra!) and multiple screen protectors. Once you've got the phone in your hand, you’ll immediately notice the dual selfie camera of 16+8 MP (to take DOOGEE-coined "wefies"), the one on the right is also a 130 degree wide angle lens. Next to this is the speaker for phone calls. Flip the phone around and you’ll find the vertical dual camera of 16+13 MP with LED flash. Underneath the camera is the circular fingerprint reader (my preferred shape). Otherwise the BL12000 has a standard hardware setup: microphone, USB and stereo speaker on the bottom; headphone jack on the top; volume rocker with the power button on the right; and hybrid nano dual SIM and MicroSD card slot on the left, which you can access with the pin that is included in the box. The phone itself is made of a mix of glass, plastic and metal and gives off a very sturdy look and feel. Thanks to its display ratio of 18:9, the large size isn’t difficult to operate as the slighter width makes it easier for one-handed operation. The back of the phone gives off a nice lustered impression. The craftsmanship of the phone is well done: there are no rattling bits or nothing juts out, it is all one smooth experience. And for having such a large battery, the phone did not weigh much more than other large smartphones on the market. I was expecting it to be much heavier than its 300g. What's more, it would be heavier and much clunkier to attach a battery pack to a normal smartphone. The first time you turn on the phone, you’ll get the DOOGEE boot screen with the logo. In just a few seconds, you’ll be brought to the welcome page. The next steps and screens allow you to set up your device as you would any Android smartphone: set up language, SIM cards, Wi-Fi, Google services and terms of service, date and time, and finally register your fingerprint which you can then use to unlock your phone (you can add more than one!). Once the initial setup is complete, you’ll land on the home screen. The phone is setup with the stock Android user interface, so if you’ve had an Android phone before, you’ll have no problem navigating the system. The navigation buttons for home screen, back and recent apps is on the screen itself, and can be hidden away to maximize the screen’s contents. The BL12000 runs Android 7.0 Nougat. The BL12000 might just be the solution that smartphone battery complainers have been waiting for. When asking readers about their biggest pet peeves with smartphones, the battery is usually number one. 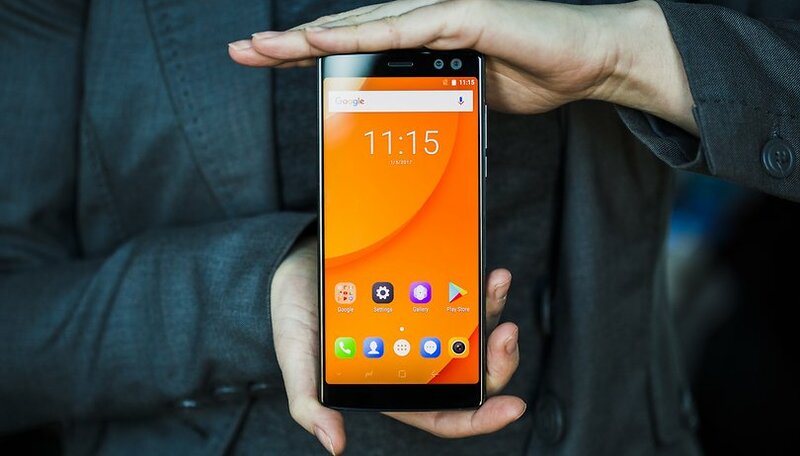 DOOGEE is responding to the calls of smartphone users everywhere with the BL12000 and promises a stock Android user interface (no bloatware) on an impressive 6-inch Full-HD+ display with a dual camera on not only the back, but also the front. It's a got a lot going for it, and this of course includes the price. Check out the DOOGEE BL12000 today to find out more about the powerful Android smartphone. I did some searching...another sight did the calculations of the battery after opening it up, and, if to be believed, the phone doesn't have a 12000mAH battery, but two 4,000mAH batteries. Even if that, 8,000mAH is a HUGE battery, but not a 12,000mAH battery. Perhaps the calculations are wrong, or some "dodgy" things are going on with the Doogee. Hi Rusty, as you can see in the tech specs, the 12,000 mAH is made up of two 6,000 mAh batteries that work fluidly together to achieve this larger capacity. How much does it takes for a full charge ? Hey! DOOGEE states it takes 4 hours to charge completely.